We went to the SFMOMA yesterdays — 4 kids, 2 grown-ups — to see an awesome exhibit by Icelandic artist Olafur Eliasson. 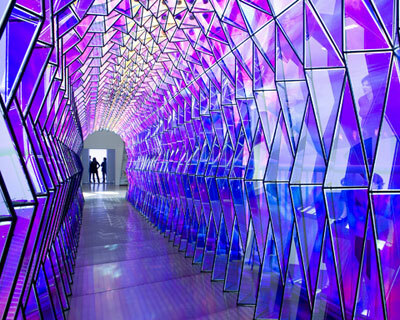 It’s great to see with kids — lots of art that you can walk through with spaces created from mirrors and light. My favorite is a tunnel across the top of the museum, pictured below. Fun advice from my friend who took us there is to go up the elevator and close your eyes before you walk onto the fifth floor exhibit. The term ‘Comet’ was coined by Alex Russell, of Dojo fame, in his post: “An old web technology is slowly being resurrected from the depths of history. Browser features that have gone untouched for years are once again being employed to bring better responsiveness to UIs. Servers are learning to cope with a new way of doing things… Comet applications can deliver data to the client at any time, not only in response to user input. The data is delivered over a single, previously-opened connection. This approach reduces the latency for data delivery significantly.” Alex’s post has a nice picture. There is also a nice detailed technical discussion here (from one of the comments). I’m about as stunned as when Jesse James Garrett coined the term Ajax. Here is something that people have been doing for years; it is not a single technique, there is no spec, no RFC, instead it is a name for a programming method. I guess I’d feel better if it was called a “Comet pattern” and discussed purely amongst the geeks. However, like Ajax, Comet has become a marketing term, where it is easily confused with words like Web, which is backed by the precision of the HTTP spec, or email, which is clearly defined by SMTP, MIME, POP and IMAP. Nevertheless, I suppose it is useful to have a catchy one-word name for common functionality. Just as the gang-of-four named common software methodologies, they called Design Patterns, or GUI elements (windows, menus, tabs) can have significantly different implementations and detailed capabilities, Comet has no underlying protocol or specification; it describes the capability of creating a socket-like connection over HTTP, of layering multiple requests and multiple responses over a single request-response of an HTTP connection. In the late 90’s and early 2000’s, we called this “HTTP tunnelling.” It was common for streaming and messaging applications to apply these techniques. (I led the Flash Media Server project when RTMPT was created.) These were native code applications which could implement a socket connection; however, most firewalls can be configured to prevent this. Most corporate or home firewalls will allow any traffic over port 80, but some actually look at the data going over the wire and restrict it to that which contains HTTP headers. Some firewalls go so far as to prohibit long-lived HTTP sessions, ensuring that each request ends before the response is returned and that each response has a limited length. Therefore, correctly implemented Comet applications do need to poll, in order to be compatible with all firewalls (a minor correction to Alex’s post). I listened to a podcast interview with a number of women who are mentors in the google highly open participation contest (which offers prizes to 13-18 year olds who contribute to open source projects). It’s got some interesting tidbits about community building on open source projects and some controversial banter about the role of women. Notes below — my comments in italics. Community managers are often women. Someone noted that this project had more women than any other open source project she had been involved with. Is this a great thing where we’re seeing more women in open source? or is this the-women-taking-care-of-the-kids thing again? — ouch. I’d say yes, to both questions. …coding is fun, and it is an awesome feeling to fix a bug or add a feature, but the human connection is even more rewarding. — yeah, I like the human connection stuff too, but sometimes it is really hard to carve out time to code. It certainly isn’t one of those socialized female traits to ask whether this newbie’s future contribution is really more valuable than whatever you are working on. …Women may be drawn to these roles, but there are also a lot of men are very good at that. Absolutely. …gnome love mailing list offers a great approach. People will give you something bite-sized to work on. The neat thing about these tasks is that it’s not just easier for the new contributor, you also need a much smaller commitment from the mentor. It is a way for a contributor to start small and many folks start there and then take on more central tasks. …should we target some kind of stamp-of-approval for a women-friendly project? No, we should lower the barrier for all contributors. Frankly, with open source, you do need to elbow your way in. It is pretty intimidating to a lot people not just women. If you make it less intimidating to join your project, you will get more kinds of people, not just women.